Wow the early bird brush set & GWP look so tempting!!!!!!!!!!!!!!!!!!!!!!! Only around 80 brush will be given out and its based on first come first serve basic, so it is advisable that you go on the 26th Feb morning itself. 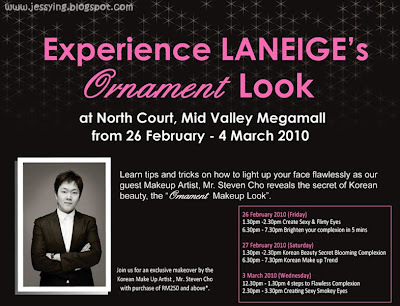 For Laneige 2010 Spring Collection - Ornament , click here to see !